Personal righteousness, that’s how. Who says so? Not Paul, that’s for sure; he thinks you get right with God by accepting the salvation made possible by Jesus death (Romans 1.16-17). Jesus on the other hand thinks it’s by being righteous. More than this, he says God will treat you in exactly the same way you treat others. He makes this point repeatedly; what the believer will receive from God will be in direct proportion to what the believer does. Do Christians believe that the degree to which they demonstrate mercy and forgiveness to others is the degree to which God will demonstrate it towards them, both in this life and the next? It’s not that Christians don’t help the needy. Clearly many do, as do some atheists, Jews, Muslims and all manner of others. No, the point is that Christians have lost sight of the fact that for Jesus such behaviour directly equates with righteousness, which in turn determines one’s ultimate fate. There really is no getting away from the correlation that Jesus is at pains to underscore, particularly in Matthew and Luke’s gospels. The only recourse seems to be to disregard it, which most Christians are content to do. They are much happier with the self-centred faith that Paul offers in Romans 5.17, ‘the free gift of righteousness’. This makes far fewer demands, carrying only the minimal expectation that one’s treatment of others has any bearing on one’s own well-being. Except this isn’t how it works, not according to Jesus; God’s forgiveness, blessing, compassion and removal of judgement are entirely conditional. To Jesus, a ‘measure for measure’ arrangement is how one attains righteousness, which is not God-given, but is worked at in the practicalities of daily life, in relation to others. I dared to suggest this recently on a Christian blog and was berated for making a ‘Satanic’ suggestion. Not me, but the one Christians say is the Son of God, God himself even. Evidently this doesn’t extend to knowing what he actually says, taking notice of it and doing something about it. ‘We’re not socialists, you know, even if you are,’ they said. ‘Saint who?’ the Lord said. And, lo, the self-righteous stepped forward, ready to surge into heaven. Do not judge, so that you may not be judged. For with the judgement you make you will be judged, and the measure you give will be the measure you get (Matthew 7.1-2). But I say to you, love your enemies and pray for those who persecute you (Matthew 5.44). What Jesus really meant to say here, surely, was ‘criticise those you don’t like, claim they’re infringing your rights, sue them if need be’. Yes, that’s it. Give to everyone who begs from you, and do not refuse anyone who wants to borrow from you (Matthew 5.42). Really? Let’s give it a go. Beg a Christian to pay off your mortgage or ask to borrow the cash for new car. See how far that gets you. 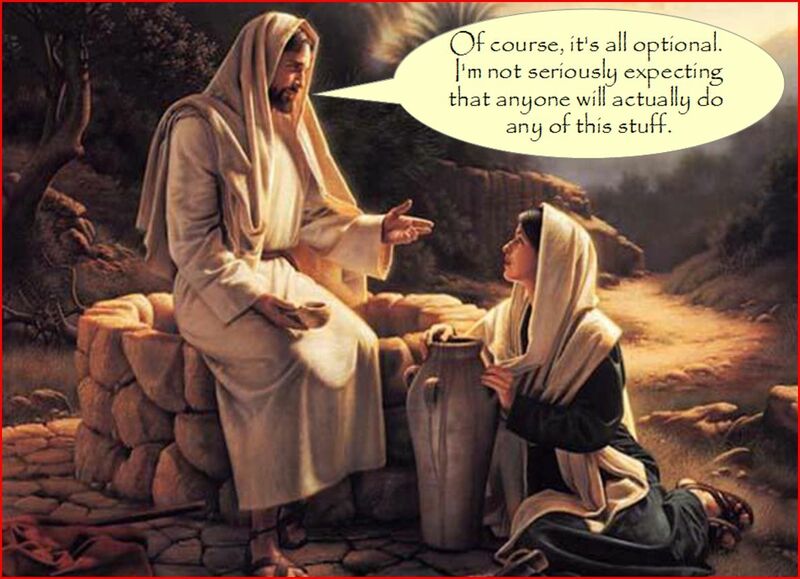 The problem here, as with all of these commands, is that Jesus really has no idea. No wonder Christians ignore this one. How can you say to your neighbour, ‘let me take out the speck in your eye,’ when you yourself do not see the log in your own eye? You hypocrite, first take the log out of your own eye, and then you will see clearly to take the speck out of your neighbour’s eye’ (Luke 6.42). If anyone strikes you on the cheek, offer the other also; and from anyone who takes away your coat do not withhold even your shirt (Luke 6.28). Do to others as you would have them do to you (Luke 6.31). So how about it Christians? Maybe if you were doing what Jesus commands instead of judging the rest of us, we might take you a little more seriously. And, assuming he’s up in Heaven watching you – though even you know he isn’t or else you’d be doing as he tells you – so would Jesus himself. For more on this topic – Christians’ failure to take any notice of Jesus’ commands – see my book Why Christian Don’t Do What Jesus Tells Them To …And What They Believe Instead, available from Amazon.